I had no opinion on his hair until I read this but Yes! More choreo please! So I'm de facto in favour of the curls. no no no! The curls give him personality! Why cut that gorgeous black pretty little curls.. Agreed, this curl looks cute on him. A pleasure to watch. Outstanding!!!! Go get em Jason!!! Come on poor Boyang must have been knackered with arriving so late due to visa problems. I for one love watching him. At least he made an effort with his costumes. Esp liked the red. OK I have a soft spot. 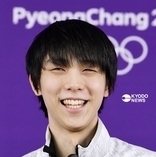 Those backing out of GPF.... Its worth going just for this guy!!!!! I'm going to second that. He was amazing at both ACI and Skate Canada. Super consistent, too. He's worth keeping your tickets for. I liked Jun a lot at Helsinki and he was not at his best. Also I would be excited to see 2 girls with 3A in one comp.